PIP (personal insurance protection) is a commonly used abbreviation in the insurance industry. Encompassing both lost wages and medical expenses, PIP is often referred to as “no-fault” coverage because it pays for lost wages and medical wages regardless of which party is responsible for the accident. As a result, PIP is often an attractive option for an insurance policy because a person will be able to receive compensation even if he or she was at fault for an accident. New Jersey is just one of 13 states that require PIP insurance with most states preferring to make PIP coverage optional. While this is the basic idea of PIP, the system can be complicated and difficult to navigate without the assistance of a skilled attorney. One of the most challenging parts of PIP is that even if a person has this type of coverage, insurance companies are still often hesitant to pay benefits. It can help navigate the PIP process if a person knows some of the important details about the PIP process. Death Benefits. If a person dies due to injuries incurred from an accident, PIP will compensate the deceased person’s loved ones death benefits if that individual was a provider of income. PIP will also pay benefits for reasonable burial, cremation, or funeral expenses up to $1,000. Lost Income. PIP covers lost wages. The exact amount covered depends on the type of policy that a person carries. These limits, however, will not exceed a person’s normal income. Medical Care. PIP includes reimbursement for all medically necessary expenses for the diagnosis and treatments of injuries that occur as the result of the accident. This care can include ambulance services, diagnostic tests, hospital stays, medication, physician visits, therapy, and rehabilitation. In most cases, the resolution process for PIP insurance will occur between medical professionals and the injured party’s insurance company. Medical professionals will submit an insurance bill for benefits to the insurance company. If the insurance company refuses to pay these damages, a medical professional will then work with legal counsel to file a PIP arbitration claim on the injured party’s behalf. During arbitration, a third party called an arbiter will hear both sides of the case and decide how to resolve the dispute in accordance with rules established by the Department of Insurance and Banking. A large number of disputes result in arbitration because insurance companies are almost always resistant to part with their money. One way that injured parties can avoid dispute is to have medical treatments pre-certified by insurers. Even if an insurance company denies a pre-certified medical treatment, they will still be required to pay for a treatment provided that it can be established the treatment is medically necessary. The number of obstacles that can arise in obtaining adequate compensation during a PIP case can be substantial. As a result, it is important for parties who want to obtain compensation in these situations to obtain the assistance of the most seasoned legal counsel possible. Our law office has significant experience helping individuals navigate the many complicated issues that can arise on the way to obtaining compensation from PIP. No matter the details of your accident, you can succeed by relying on our law firm to help you obtain adequate compensation for your PIP claim. 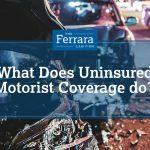 Contact Ferrara Law today.